I have been working in the area of disaster mental health as a psychologist for over 10 years. During this time, I’ve seen a few responses to emergencies, and some recovery processes too, as well as being involved in the work of preparing for disaster and understanding how people perceive risk, and actions they take on those perceptions. Or, sometimes how people discount risk so that they don’t have to contemplate uncomfortable truths, meaning they can carry on as they are rather than be forced to take action that would greatly disturb how they currently live their lives. One way I try to represent this in this series of photographs that I have made is through our relationship with place and time. The end of the day means it is time to be with the people we care about, to leave work and to re-connect with each other as the day draws to a close. We live in a beautiful country, so what would be better than to move to a high viewpoint to watch the sun set and the light fall on the sea, with big open skies to watch the colourful show as the stars begin to twinkle in the twilight, and to share that experience. But to share in modern life means more than to share with just the people we are physically in that place with. It means to share with a much wider community online. And when I take the photograph with that mobile phone, perhaps I become a little less connected to the people I am physically with, and more concerned about who might be watching what we post online from afar. How will they judge what I post? Maybe I need to exaggerate the photograph, just a little, to make sure they understand what an amazing moment this is that I am sharing with them. But as the screen dims to our eyes, as it does when our eyes have been looking at it for a while, as we judge that the colours aren’t quite popping off the screen as we would like them to, we perhaps turn the sliders up to far, causing our photograph to become quite disconnected from the scene we are actually looking at. It is this disconnection from experience that I am interested in exploring. It isn’t the making of the photograph that causes us to become disconnected. I wonder if it is because we show this to others online, to a large audience, that causes us to loosen the connection between reality and representation, to exaggerate the colours and the landscape we see, to meet with the approval and liking of others. To create a hyperreality. To me, this distortion of reality to meet the needs of the audience isn’t new in photography. It isn’t new in the study of risk perception either. Of course, it isn’t a universal experience, for example, the use of the #nofilter hashtag is a nod at least to an acknowledgement of the augmentation of images that happens more often that not. The idea of solution aversion is one way to understand this; we alter our view of reality to be as flattering as possible. When we look at the world around us and we see problems, like climate change or inequality, people may be motivated to deny problems and the scientific evidence supporting the existence of the problems if we don’t like the solutions being proposed. Similarly, if we don’t think the scene we are witnessing is good enough to share compared to how we think it should look, or indeed in comparison to all the other sunset pictures that are being posted on social media, then perhaps we alter reality to become as flattering as possible. Because the other solution would be to post the picture as it is, and the feared outcome is that we will be ignored. As we alter reality to avoid being ignored, and to increase the likelihood that our image will be liked, I wonder if we become increasingly disconnected from the reality of the world we live in. Instead, we unconsciously choose to romanticise the land and our experience of it as perfect, ambient, and the envy of the world. I wonder if we do this so often because when and if we take a long look at our world, we see problems that are hard to fix, and will take concerted action by individuals, communities and nations to make the difference that catalyses real change. It’s easier to alter our perception of reality rather than to grasp the hard solutions to make real change. But, if we continue to do this romanticise our landscape and create hyperrealities, then I wonder what reality waits for us. It's an exciting day today as I launch my first exhibition today. 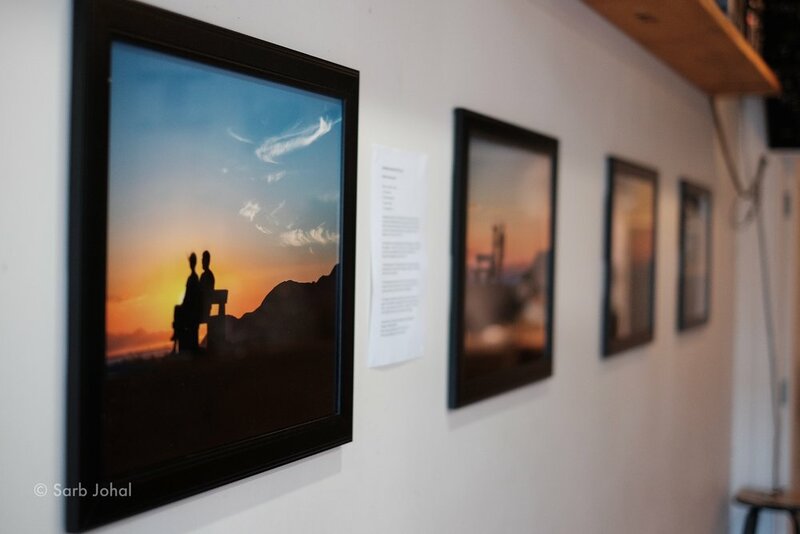 Here are some images of the 4 photographs being displayed at Raglan Roast Cafe on Abel Smith Street, in Wellington. And here's the artist statement I have on display there too. I've put up another post here describing the thought process behind this sequence of images I have decided to explore too. This exhibition by Dr Sarb Johal opens on 26 April and is located at the Raglan Roast cafe, on Abel Smith Street in Wellington. This series of 4 large images explores our relationship with our landscape, and how we tweak the photos we take on our cellphones to get more likes for that amazingly beautiful sunset. I am interested in our relationship with the landscape of Aotearoa New Zealand. In this work, I look at how we romanticise what we see, trying to create sharable moments that perpetuate our fantasy of New Zealand as we like to see it. This small sequence of 4 images finishes with questioning what might await us if we only see the Instagram-able shot; most likely fewer ❤ from the land itself. The photographs were made on the south coast of Wellington looking out towards South Island in the summer of 2018, at the small dog-friendly park off Bann Street in Southgate. The images were edited in Lightroom and printed out on archival paper. I’m interested in bringing photos back to life by printing them - so many photos live online only. A Fujifilm X-T1 with 50-230mm lens was used to capture the images. Dr Sarb Johal is a clinical psychologist and photographer. Many thanks and humble bows to Raglan Roast for hosting this exhibition.